Big Bentley claims a 336km/h top speed. To be released in 2017, Bentley has revealed its most powerful production model to date; a luxury supercar known as the Continental Supersports. The British coupe is powered by a twin-turbo 6.0-litre W12 that produces a whopping 522kW (700hp) at 6000rpm and 1017Nm of torque at 4500rpm — yep, it’s fast. All that power translates to a 0-100km/h time of 3.5 seconds, and allows for a top speed of 336km/h. Fortunately, the Continental Supersports is more than just a big donk, with a bespoke torque-vectoring AWD system to handle the grunt. Providing the motive power is an uprated version of the 6.0lt W12 powerplant feeding an eight-speed transmission. In explaining what’s been changed, the company says, "Key to the Supersports additional outputs are newly designed, higher-capacity turbochargers and a revised charge-air cooling system which create more boost and additional power. In order to harness these additional outputs, upgrades have also been made to the Continentals cranktrain, including new main and conrod bearings." It rides on 21-inch wheels with carbon ceramic brakes. On the outside, the Supersports boasts a sporty front fascia with an integrated splitter, and a rear fascia with a carbon-fibre diffuser. The car’s stance is extra aggressive thanks to its wide body kit with flared wheel arches. After unveiling what Bentley claims to be "the world’s fastest and most powerful luxury four-seat car", chairman and chief executive of Bentley Motors Wolfgang Dürheimer said, "The Supersports name is legendary at Bentley. From the very first Supersports of the 1920s, to the Continental Supersports of 2009 – and now with the third iteration of this iconic model – it is a name which excites, impassions and thrills." In typical Bentley fashion, the Continental Supersports aims to be as luxurious as it is fast. 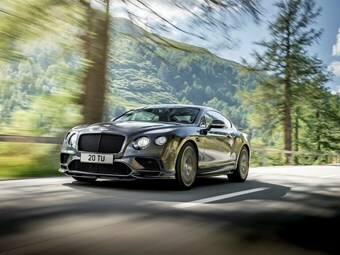 "Only Bentley could create a car which blends immense performance and unrivalled luxury in this way," Dürheimer claimed. The interior is finished in tri-tone Alcantara leather with carbon-fibre touches, and features a bespoke Supersports steering wheel and gear knob. Pricing and local specification have yet to be revealed, though we suspect the outrageously-powerful Bentley to have an equally outrageous price tag.